With the killing of two unidentified militants of the Al-Mansoorian outfit, the 24-hour encounter in the central Budshah Chowk area ended here today. 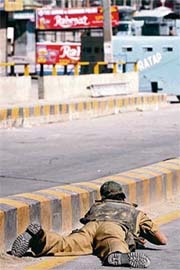 Eight others killed in the encounter included five police personnel, one of them an ASI, two CRPF men and a civilian, while 18 persons were injured. Do you think South Africa is the gateway to the African market? India committed mistakes right from the beginning of the election to the post of the UN’s Secretary-General. The government today announced the constitution of a four-member sixth Central Pay Commission thus paving the way for the revision of salaries of over 33 lakh central government employees. Family members of Mohammad Afzal Guru, who is facing execution in the 2001 Parliament attack case, today met President A.P.J. Abdul Kalam and sought clemency for him. 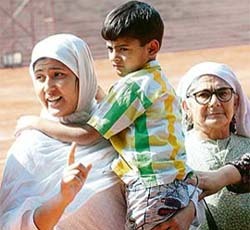 Tabasum (left), wife of Mohammed Afzal, with her son and mother-in-law, addresses the media outside Rashtrapati Bhavan after a meeting with President A.P.J. Abdul Kalam in New Delhi on Thursday. The convoy of former Chief Minister Parkash Singh Badal last night met with an accident near Bhokra village resulting in injuries to four of his security personnel. Reflecting the insensitivity on the part of the authorities, an 11-year-old autistic boy was prevented from boarding a flight at Bangalore by CISF personnel who said he could harm other passengers. Two girls, including the sister of Bollywood actress Kangana Ranaut, were injured when an unidentified man threw acid on them here today, a police official said. The Indian Air Force is thinking of purchasing French Mirage fighters to maintain an effective airpower strength as an interim measure in the wake of delays in finalising the contract for buying 126 multi-role combat aircraft.